Chandler Ellis takes a look assessing his brickwork at the Maine School of Masonry in Avon. After nine months Chandler will be trained in a profession for life. Nestled in the hills along the rolling river Avon just outside of Farmington is a hidden gem of a school, Maine School of Masonry. The country’s only private non-profit masonry school continues to be a dream come true for its founder, Stephen D. Mitchell, who opened its doors in 2005. Since then, Mitch has taught hundreds of students the fundamentals of laying brick and stone work empowering every one who graduates with the skills to start their own masonry business — just after 9 months of intensive hands-on instruction. “It’s hands-on from the beginning,” said Mitch. Students must complete 1,350 hours of coursework, including 35 or more assigned projects. The art of masonry is tragically becoming a lost skill in a time when the demand for masons is incredibly high. The school has begun to change that by teaching new generations in the craftsmanship of stone masonry. In Maine mill closures have become all too regular. Big retail chains are also leaving the state at alarming rates. Automation is throwing good workers out of jobs. 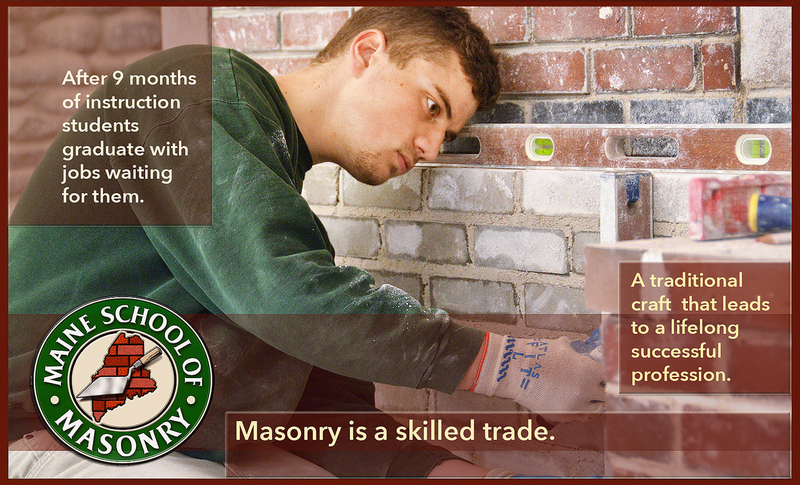 Masonry is a skilled trade, a traditional honored trade — one that could lead to a life long profession. Students who want them have jobs lined up through the school before graduation. Ancient pyramids, the Washington Mt., Maine’s State Capitol or any other stone or brick building that marvel visitors never could have been built without experienced masons. The level of complexity involved in masonry work varies from laying a simple wall to installing an ornate exterior, patios, brick ovens, garden walls, the perfect chimney, ornamental stonework or a high-rise building, and always will require the skill and precision of a mason. No automation here. “We’ve got so many talented workers out there looking for a good life long job. Masonry gives them that opportunity. They can take that skill anywhere and set up shop,” said Mitch. Being able to offer new generations a future in an age-old profession is a passion with Mitch who travels to schools throughout the state. Not long ago the school received an inquiry from Long Island, New York asking for graduates to come work and earn $65 an hour. Becoming a quality mason is more than ensuring a plumb-line is exact when leveling out a brick or stone walls, although every student has to learn these basics. It’s a craft that requires sensitivity to the materials and that only comes from good training and experience. Like any other art, the mason has to have an instinctive feel for the craft. Mitch has a talent of bringing out those innate abilities in his students as they build different projects in the workshop. The future masons come from right down the road or as far away as Texas, Wyoming and Montana. Mitchell accepts up to 12 students every year from various backgrounds and all ages. Most days, inside the 4,000-square-foot building students are eagerly building different projects in the workshop. Their fireplaces, chimneys, walls and archways will be taken down in the fall brick-by-brick to be used by the next class. Class work mortar lacks an element that cements it, making it easy to take apart. Recently the school expanded its programs and out reach to offer historic stone/brick renovation and preservation classes. Restoring historic buildings is a specialized skill that demands good wages. All across the country historic buildings are in need of renovation. But while the materials for historic renovations are readily available, there is a shortage of trained quality craftspeople, masons, to do the needed repairs and restoration work. The new courses take students through materials and processes of proven methods to conserve, repair, and preserve stone and brick buildings, statuary, and monuments. “It’s hands-on from the beginning,” said Mitch, founder and instructor at the school. Students must complete 1,350 hours of coursework, including 35 or more assigned projects. In partnership with the owners of historic landmarks and with the state’s approval, Mitch and his students have begun work on restoration and preservation projects at the Kennebec Arsenal, Fort Knox, The Old Wiscasset Jail and Rangeley’s Historical Society this spring. The school and dormitory are located at 637 Rangeley Road. For more information call 639-2392, or visit masonryschool.org or their Facebook page. Enrollment for the fall is now open.